Local governance isn’t easy here. And then there are flies. In the first instance, the “flies” [苍蝇] are the lower local ranks of the Communist Party, particularly officials in the countryside, engaged in corruption—that is, “flies”, as opposed to “tigers” (political elites here in China). There’s been renewed attention to local corruption here lately, particularly its spillover. A commentary in Nanjing Daily on Tuesday noted that “some village cadres are not only corrupt, but also arrogant” [一些村干部不仅贪腐，而且相当嚣张]. They exploit farmers, loot poverty alleviation funds, cheat on official expenses, and act less like “village officials than village tyrants” [村官变成村霸]. The author argues that while they may be “small officials, but their greed is gigantic.” [小官巨贪] and “although the power of local village officials is not large, the lack of effective supervision will breed a more serious corruption problem, causing adverse effects among villagers.” Residents who see authorities unable to address low-level graft end up with less trust in local government and in the Party generally, the commentary argues. One reason for the hubris of village officials, the commentary claims, is that there’s still no clear way to hold them accountable. At the grassroots level, whistleblowers [举报人] are often retaliated against by local officials. Many villages are run by clans that have dominated for generations, the commentary notes, and have intimidated those who wish to bring about change. There’s an atmosphere of fear for those who want to improve their locality but lack political protection. Everyone in China knows about payback. Efforts to make village finances more transparent and thereby expose local corruption haven’t shooed away many “flies” either. When records that might indicate graft are released to residents, the essay argues, the accounting is often too complex for many villagers to understand, or the bookkeeping is incomplete at best, rendering inspection useless. We've been here before. What’s different is that this commentary thinks that “flies” can be swatted and shouldn’t be ignored for the sake of caging tigers—that there are weapons available. For example, using “Big Data” to supervise village officials, instead of rural residents. Efforts would be made to collect, collate and compare government subsidies (such as poverty alleviation funds) with actual local expenditures, and use those results as one of the main means to evaluate cadre performance, “so that the village officials have no place to hide” [从而让村官贪腐无处遁形]. Discrepancies in these figures would mean no political promotions until inspectors conducted their own investigations, and heavier punishment for those caught cheating than exist currently. The commentary also argues for greater coordination between government bureaus and Party departments about who gets appointed and elevated in rank. Often, village officials are promoted just because a case couldn't be made about their malfeasance until later in their careers; the warning signs were already there but not shared with the responsible departments. Bad cadres end up getting ahead because not everyone knew they were bad from the beginning, in part because information isn’t shared across agencies and levels. Cooperation can help to crush “flies”. And those other “flies” mentioned above? 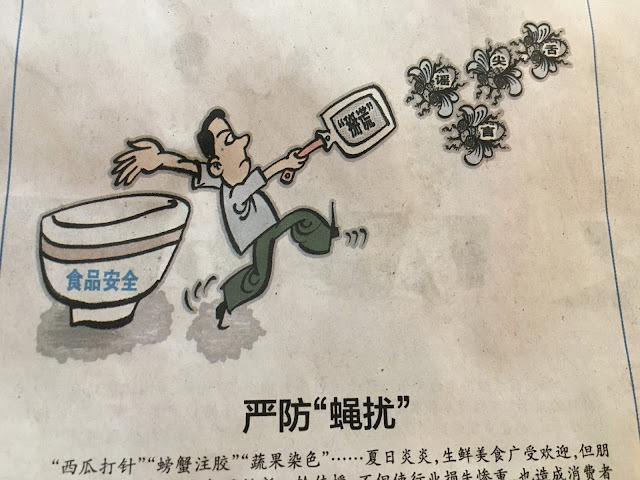 Those would be somewhat different—according to a cartoon and brief discussion on the same editorial page about those “flies”, in this case, 蝇扰--the sorts of flying insects that buzz about, irritate, bite, and can spread disease. 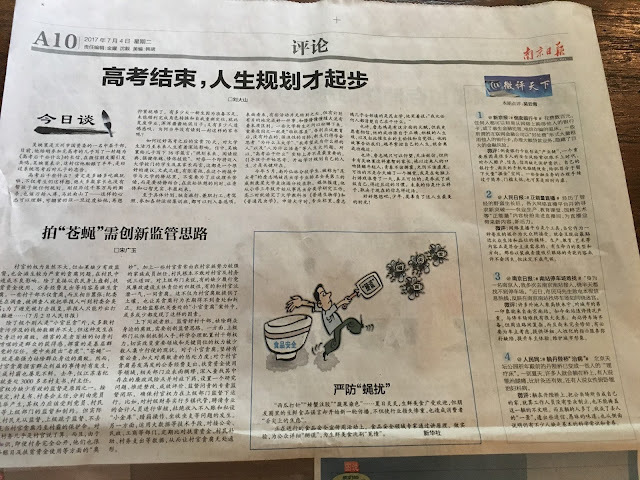 While the commentary on the same page focuses on corruption, the picture and caption are about rumors [谣言]--stories flying around on the hot winds of summer, about fresh food not being so fresh, fruit being dyed or injected with artificial substances, and other purported hazards. According to the caption, such “lies” [掰谎] need to be thoroughly swatted down because they’re an injustice [冤情] to the industry and the consumer, and hazardous in themselves. The State shouldn't let them swarm, and officials need to do something about that. At the very least, the latter type of fly diverts attention from more crucial tasks of local governance. And who’s supposed to do the whacking anyway? Is it the authorities, or should it be residents? Both of these editorial forays insist that the response should be top-down, rather than bottom-up. Perhaps that's right: Officials should do the clean-up work, not the public. Let swatting, not dialogue, be the solution. Then again, maybe that’s the reason that one sees so many flies about these days. For the rumours problem, I wonder whether the editorial intention is to soften the ground so as to get the public's agreement when the government clamp down on alternative sources of information such as those on WeChat, or is it really truly hoping the government can do more in dispelling rumours. I guess it could be both. Thanks very much for your take on this issue. I think that it is likely to be both--not as a coordinated strategy so much, but the result of unreconciled views in the policymaking apparatus. By going after rumours, both hardliners and others get their shout, and see their views put into place. Of course, it's also true that there's a real concern with losing authority over the main narrative.